Why Are Rain Gutters Necessary? Cleaning gutter is a difficult task to complete and by the time you are done, it leaves you feeling as though they are not worth all the hard work. Wait before you throw out the idea of having gutters because they are needed. They pose an important role. 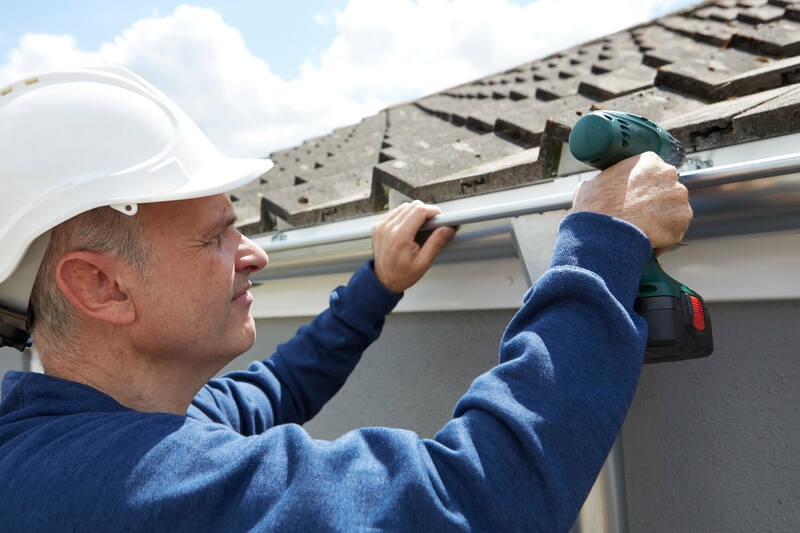 I will walk you through the reasons why they are important and maybe you will think twice before a definite “no” when it comes to the idea of having gutters on your home and how to clean them easier. When you are trying to get into your home on a rainy day the gutter acts as an umbrella hanging above. It does not stop the rain from falling on you while you are fumbling for your keys, but it does stop a tremendous amount from being poured on top of you and all your things as you cross the threshold. You see, water starts rolling down the structure of your roof. As it rolls down it collects with more rain that is collecting atop your home until it meets the side of the roof and pours down in a steady flow. That is a good way to ruin your outfit, hair or even electronic device, plus it’s cold no matter what time of year. You do not want your small children or elder adult family walking under it causing a cold and such. This is not all though! Not by far. Besides the unnecessary water being tumulted upon your head when trying to get in the door, it serves a bigger purpose and I think you will be very interested to know what that purpose is. You are probably wondering what the inside of your home has to do with the necessity of gutters, but I must tell you that it has everything to do with it! Have you ever looked a or seen a home that has water marks on the ground from where the rain has rolled down the roof and landed making an indent? This can be very bad for your home. The mud can also splash the side of your house making it look completely filthy but there is a bigger picture I am trying to paint here. That water can cause damage to the basement of your home. If you don’t have a basement but rather a crawl space, you are not exempt either. The fine folks at Hawaii Rain Gutter Service, a professional gutter installer in Mililani, Hawaii, says without proper gutter installation and having a gutter period, your home can suffer water damage to its foundation. No one wants to go to into their basement after a rain and finding water down there. The cost and hassle of gutters are certainly worth dealing with than without. If the soil around your home tends to be saturated most of the time then that can pose a bigger problem than just water in the basement, it can cause issues with the whole foundation of your home. With gutters in place, the water runs where it should and keeps the important factors of your home from water damage and rotting. You can find more information at TheGardenWeb.com. Here Are Some Tips for Cleaning Your Gutter. Now that you know the importance of gutters, I hope you have decided on them! I want to give you some resources and tips to make the job of cleaning your gutters easily and even where to purchase gutters for your home. The key thing you will need when cleaning out your gutters is a ladder. Without it, there will be no access to clean the gutter out. A scoop is very helpful. Make sure that it is small enough to fit inside the gutter tops. When scooping out the debris drop them into a beg right away or have a tarp laid on the ground to easily toss the guck out. Once you are done scooping everything out you can take your water hose and run it to the gutter to flush out the small stuff. This helps in detecting any damage the gutters where leaking can happen and cause more damage if not addressed soon. You can find some safety tips and information on where to buy a gutter guard at houselogic.com. The gutter guards help keeps the gutter clean and requires very little work. You can also purchase gutters at the Amazon link here at amazon.com. The gutter guards can be found on Amazon too. I highly recommend them. They make everything so much easier. Cleaning gutters is hard, but it doesn’t have to be. They are very necessary for the structure and foundation of your home. The price of gutters outweighs the price and time damages take when not having them on your home. Always use safety first and take your time while on the ladder. If it proves to be too much to handle you can always hire someone for $50 to$250 depending on how much gutter length. What happens if I don’t replace my Windshield?